From the producers of 300 and directed by Tarsem Singh, Immortals is a 3D fantasy action based on the Greek myths of Theseus and the Minotaur. Taking place in 1228BC, a mortal man named Theseus (Henry Cavill) is chosen by Zeus (Luke Evans) and the Greek Gods to lead a fight against the barbarous King Hyperion (Mickey Rourke), who has declared war on Olympus after the Gods fail to answer his prayers. Hyperion, now on a rampage across Greece, seeks the magical bow of Epirus in order to free the Titans, defy the Gods and destroy all of humanity. Theseus, however, now seeks the Bow for himself. After escaping from prison and befriending a prisoner named Stavros (Stephen Dorff), he meets the beautiful oracle Phaedra (Freida Pinto) who is convinced by her own disturbing visions that he may just be the key to stopping the destruction. With her help, Theseus assembles a small band of followers as, after stealing the bow for himself, Hyperion’s soldiers attack Phaedra’s temple and release the Titans. With Hyperion forcing his army to face a war against the Gods themselves, Theseus must embrace his destiny in a final battle to save the future of humanity. Full of epic and gore-filled battle scenes, Immortals really reflects on the producers unique style of the same brutal yet brilliant action sequences that made 300 so successful back in 2006. These fighting scenes are a dominant part of the film that has again been proven successful by being able to inevitably pull any story out of the mud by glittering it with blood and gore. But that’s the problem with Immortals, as it falls heavily dependant on the use of these visually appealing battle scenes to put a new take on the often-told stories of Greek mythology. Without including this 300 influence, the film would really struggle to stand out from the crowd, but whilst they are a huge part of the film, one that most will look forward to seeing, if you have seen 300 beforehand then you do know what to already expect here. Exaggerating this, the story line of Immortals comes close to many other films as well, especially with the recent Clash of the Titans due to its heavy reliance on magical and powerful beings and mythological creatures. These constant similarities affect the film negatively throughout, as the similarities are made constantly aware and become too obvious to allow Immortals to be distinguishable or to take its 300 influence to another level. These similarities do, however, serve as an advantage as well, as Immortals manages to be of a lot higher quality by showing many strengths and improvements in other aspects. Like many of the other fantasy, myth-based films that are easily comparable with Immortals, it’s often easy to get lost in the film’s plot as you usually find yourself needing to pay close attention for the storyline to make sense. As an advantage of being able to compare its highs and lows, Immortals manages to avoid this. Whilst many have criticised the film’s lack of rich narrative, the storyline throughout flows at a fast and linear pace, which keeps you from getting confused by unnecessary characters or from getting bored over exaggerated scenes. Because of this, the film, in a sense, manages to pull off its familiarities by bettering them, concluding that if you had a choice out of which Greek myth-based film to see then it would likely be Immortals that would come out on top. Another for reason the film’s success despite its downfalls is its use of stunning visual effects that contrast beautifully against the scenes of bloody violence. The battle scenes in Immortals may be a dominant part of the film, but there are also many scenes of great creative, and this is what allows the film to take precedence of others in its genre. The CGI is extremely pretty (there is no better word to describe it! ), with one scene at the end of the film really standing out. 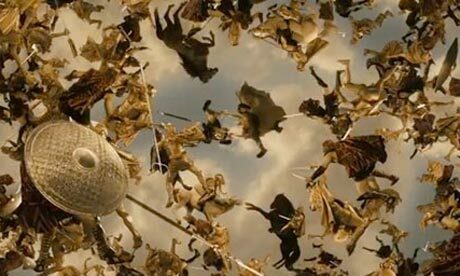 As seen in both the trailer and the image below, the camera pans out to show thousands of soldiers fighting as if standing on a perplexed surface in the clouds, and it really does look amazing. Something else that stands out from Immortals is its interesting choice of cast. British actor Henry Cavill, who will be playing Superman in 2013’s Man of Steel, takes the lead with great strength. Lacking inspiration in places, he really fits the part of a rage-filled man which gives us a not-so-subtle glimpse of what we can expect from his big screen role next year. Mickey Rourke is also a very strong character in the film, but whilst his character comes very close to that of his role in Iron Man 2, there is no denying that he makes an incredible baddy. John Hurt (Tinker Tailor Soldier Spy), as well, plays a small role in the film which is great to see him in, and Frieda Pinto (Trishna) really stands out in her character. Luke Evans‘ (The Hobbit: An Unexpected Journey) also stands strong with his enjoyable performance as Zeus, especially as we will be seeing him reprise his role as the son of Zeus, Apollo, in Wrath of The Titans later this month. Overall, Immortals is a stunning piece of cinematography, but it’s unlikely that it will be remembered for anything else, if for that all. Whilst it has far too many similarities to define it as anything more than another take on the Greek mythology genre, I wouldn’t deny the chance to own this on Blu-ray, as it will look truly fantastic in high-definition. It’s probably one of the best-looking films of the whole year (yet, I still haven’t seen Tree of Life) and the action is awesome and in-you-face which is something I always like. The story dragged on a bit and I couldn’t help but think that if the writing was a tweaked a little better, this would have definitely been a very solid film. Instead it was just fun and pretty to look at. Good review. I haven’t seen Tree of Life either! Might have to give that a watch. I enjoyed immortals for what it was. I liked it for the action, and for the visual appeal. The lead actor did a pretty good job with what he had to work with, but I felt that the story just didn’t come together like I was hoping. But the movie ended up being just what I expected. I thought mickey rourke did well in his portrayal as the bad guy but I must admit there wasn’t a lot of depth to him(not mickey rourke’s fault). He played the ruthless tough bad guy pretty good I thought, with plenty of grunts and gruesome acts. So the build up to his show down with theseyus was pretty fun to watch. But for much of the movie he’s sitting around trying to extract information from people or giving orders to underlings.